Chefs popularise British produce. 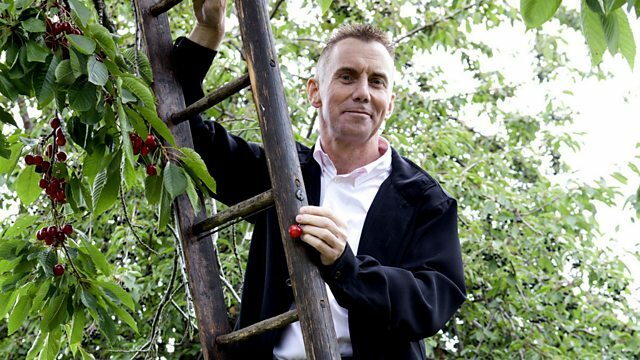 Gary Rhodes discovers that hardly any of the cherries we eat are grown in the UK. Yotam Ottolenghi is passionate about nuts. Gary Rhodes is fanatical about the quality of the produce he uses, in his relentless pursuit of perfection in the kitchen. He's horrified to discover that, not only have we lost the vast majority of our cherry orchards, but hardly any of the cherries we eat in the UK were grown here. His campaign takes him to meet growers who are trying to buck the trend and fight back, not only with new strains of sweeter, larger cherries, but with old-fashioned heritage varieties. Gary's powers of persuasion to make us fall back in love with the British cherry come to the fore in the 'Revival' kitchen, where he prepares some exceptional dishes, including his signature dessert - a delectable cherry clafoutis. Award-winning food writer and restaurateur Yotam Ottolenghi is passionate about nuts. He uses them in many of his recipes as they are an integral ingredient in Middle Eastern cookery. He discovers that although Britain has a rich history of growing nuts, most of us are completely unaware of this tradition. We can grow fantastic walnuts in the UK but not enough for them to be commercially viable, so most walnuts we eat are imported. Yotam wants this to change and for us to get behind our native nuts like the British cobnut - a nut that most people have never heard of unless they live in Kent, where it is grown. To get us to appreciate these homegrown delicacies, he creates some fantastic sweet and savoury dishes including a magnificent cobnut crumble cream and roasted aubergines with an amazing walnut salsa.